Citrus Springs Home Builder Building A New Home In Citrus Springs Florida. Located in the northern section of the county, with a population of just over 8500 people and an area of over 21 square miles, Citrus Springs is famous for being part of the Citrus County phosphate boom which occurred before the end of World War II. There are abandoned mines in the area, some of which can be seen near the Citrus Springs golf courses, El Diablo. This is middle class living at its finest. The homes are more modest than the ones in nearby Pine Ridge, and they are well kept, with residents taking pride in their community. 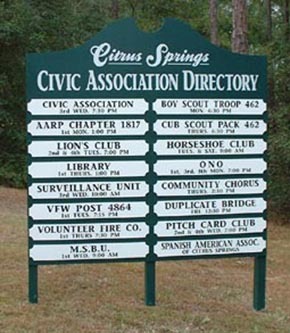 Residents of Citrus Springs value both close neighbors and more privacy as sections are both densely and sparsely developed. Nature lovers feel at home with the wildlife in the area. From eagles to owls and turkey vultures, Citrus County boasts over 250 species of birds in the area. You might hear the tap tap tapping of a woodpecker on an oak tree some bright Florida morning or the sounds of a sparrow or scrub jay calling to find its mate. Set out your favorite bird feeder and you might spot a mourning dove or a ruby throated hummingbird singing to you. Want to shoot a round of golf? 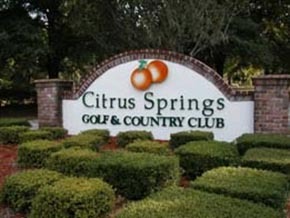 The Citrus Springs Golf and Country Club has both par 72 and par 36 courses built on rolling hills and 100 year old Oak trees for you to get some shade when you play a round during a warm Florida day. The El Diablo golf club is rated at the #1 best new affordable public golf courses places to play according to “Golf Digest”. 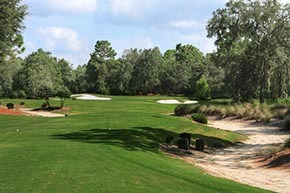 And it is considered to be one of the top 10 courses in Florida according to golfflorida.com. Completed in 1988, El Diablo was designed with the assistance of top golf designer, Jim Fazio. Steeply sloped greens are its greatest challenge to even the most seasoned golfer. Nearby beautiful King’s Bay can be compared to any water paradise in the Florida Keys. It’s a refuge for the endangered local tourist attraction, the Florida manatee, where over 500 of the famous sea cows find their homes, mostly in the winter months where an estimated 100,000 people come to view these amazing creatures. A short trip takes you to Dunnellon. It’s is a small town where the Withlacoochee and the crystal clear Rainbow River meet. The Rainbow River is a registered national landmark where kayakers, tubers and swimmers can be found cooling off on a hot Florida day. A popular public park, KP Hole, is where many locals and tourists are found every year, dipping into the waters which are a constant 72 degrees. Twenty minutes away is Ocala, horse capital of the world. Countless amenities await you in this, the closest big city. Discover fine art at the Appleton Museum or take in a play or musical at the Ocala Civic Theatre. Classical music fans hear the timeless magic of European and American composers at the Ocala Symphony. Be close to everything while getting away from it all by building a house in Citrus Springs Florida. Contact Quality Crafted Builders today!